Cooking is a huge part of the holidays for most people. The main course is definitely important but what would that be without those delicious added bonus foods? Side dishes are always very important for the holiday meals. Everyone knows that mashed potatoes are probably the best part of any holiday. 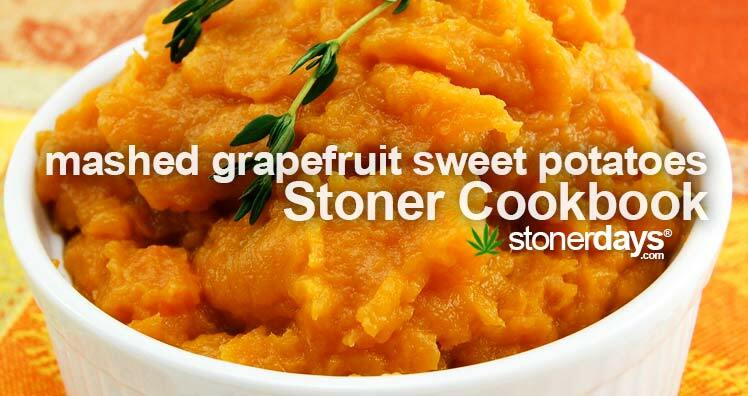 Take, for example, these mashed grapefruit sweet potatoes that also happen to be medicated. They taste good and get you high. With a very simple recipe (on a scale of 1 to 10, we give it about a 3), these sweet potatoes will be a hit at at any table this holiday season. Place the sweet potatoes in a preheated oven at 400 degrees F until they are soft. Peel the potatoes and then mash them with 3 ounces of bud butter and 1 tablespoon of rum. Place this mixture aside for now and melt the remaining ounce of bud butter with a sauté pan. Add in the sugar and stir the mix until the sugar melts fully and it begins to bubble slowly. Toss in the grapefruit and sauté this all together until the liquid is reduced by about half. Grab your fresh grapefruit juice and add that in as well as the last 2 tablespoons of rum. Cook this all together for about a minute. Add this new mix in with the sweet potatoes and mix together well. Season with salt and pepper to taste if you would like and boom! These mashed grapefruit sweet potatoes are hot and ready to serve! Enjoy! This entry was posted in Stoner Cookbook and tagged sweet potatoes.